This Snapshot nearly didn’t make it – because at first we simply couldn’t identify the car. The image is a hand-tinted photograph from China around 1952, kindly supplied by Neil Thorp. All he knew was that the tassels on the hubs were something to do with a major celebration, as were the items in the background. A lengthy trawl through “Cars of the Classic 30’s” got us close enough to think it was perhaps a 1936 Pontiac, but too much was wrong. The name on the spare-wheel hubcap also caused real difficulty, and is almost certainly a later addition. So we turned to our ever-helpful friend Kit Foster of the SAH, who immediately came back with the answer: a 1939 Buick. Their range in that year was extensive – and we are still not sure of the precise model in this picture. Founded in 1899, Buick is the oldest active American marque of automobile, and was the company that established General Motors in 1908. It also has the distinction of being the first automobile maker in the world to equip its cars with overhead valve engines, which it did from 1904. It was almost always a premium brand, sitting just below Cadillac in the General Motors hierarchy and designed to appeal to the comfortably well-off buyer who wanted something better than the run-of-the-mill, while avoiding the ostentation of the top GM marque. For 1939, Buick introduced a radical “waterfall” split grille up front and, inside, its first push-button radios, dubbed “Sonomatic”. The range extended from the entry-level Buick Special at $966 right up to the Series 90 Limited Touring Sedan at $2,350 – with only the extremely rare Touring Limousine above that. 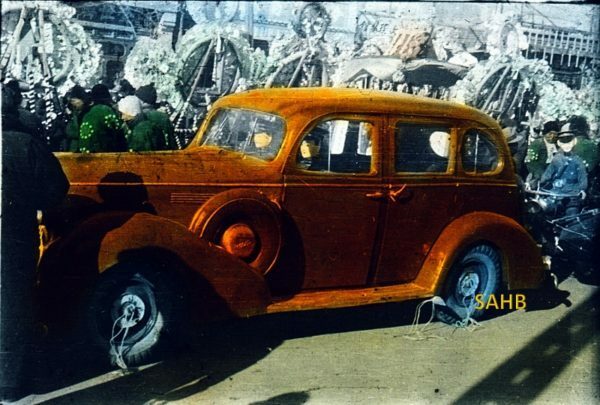 Our picture may well be of one if these Touring Sedans – but how on earth it reached China and took part in these celebrations in the 1950s we shall probably never know. Buick was always a highly regarded marque in China, which is why it was selected by the Chinese leadership to be the chosen General Motors brand when General Motors re entered that market in the 1990’s. China’s last emperor owned one, as did Sun Yat Sen. Again, Buick has a long history in China, and currently is a well regarded and strong seller there.